Some combinations aren't big. This combination is huge. It occupies almost as much floorspace as the Stromberg-Carlson Chinese Classic (see TV Sets gallery) but isn't quite as deep. It was on a visit to my "other" grandparents that it happened. I couldn't have been older than seven. 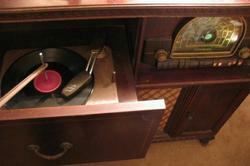 My brother Jim and I were down in their basement and he was playing with grandpa's radio. He did some kind of magic trick with it--"look at this!" he said, twirling the dial back and forth while the radio kept playing the same station. Cool! But then he pulled the radio away from the wall for a peek at the inside. 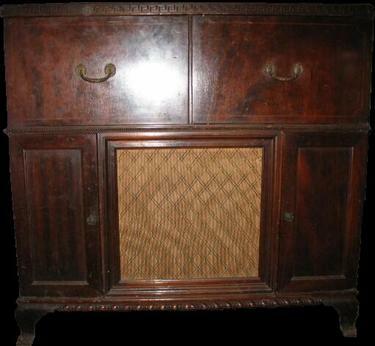 Now I had seen the back of our Packard Bell TV set before when the repairman came, and he even gave me the tubes he replaced. Little things with pointy tops. 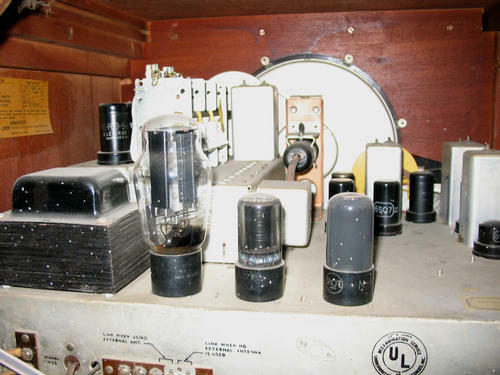 And I had taken a couple of old record players apart before, so I had seen those bigger tubes with black bases too. But what kind of tube was this? Look at that awesome shape! 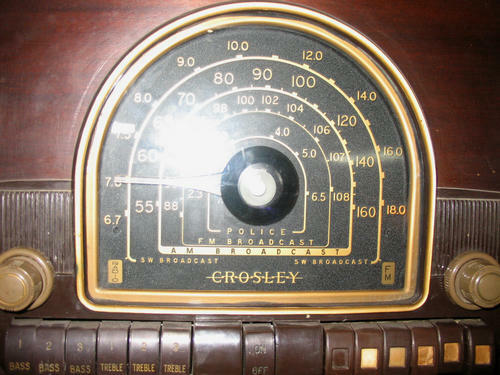 Wow, I knew old radios were cool, but I never saw anything like that tube before. Yes, one of the definitive moments of my childhood was my first glimpse of a 5U4G. And yes, it is the very one you see here. It's still awesome. OK, it really says "Floating Jewel" on the headshell, but the odd script font used--especially the way the "o" and "a" connect--makes it an easy mistake to make. Now it's the set's nickname. This one was electronically restored by Lee Beyer. The record playing is Jim Lowe's Green Door.